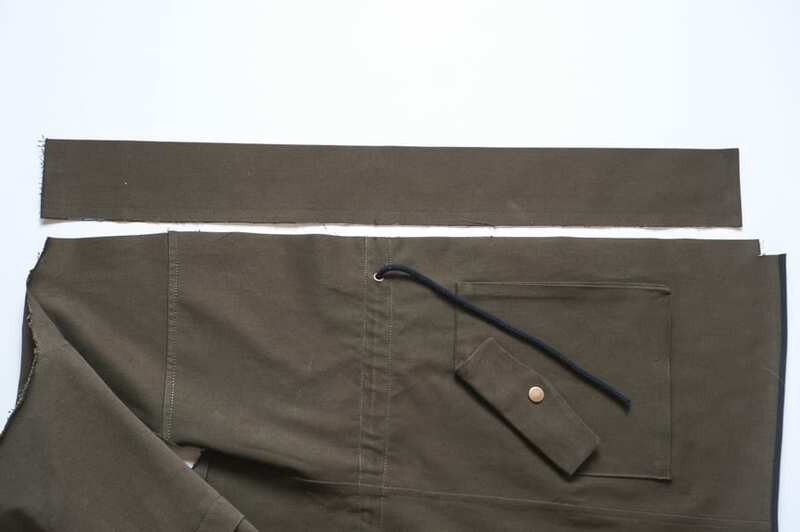 I really think that as far as jackets go, the Kelly Anorak is a totally approachable project even for a more beginner sewer. 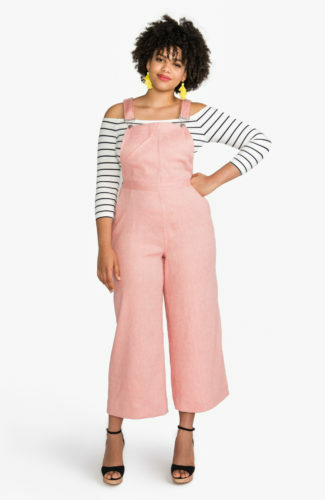 The only part I think might be a little confusing is our zipper placket. 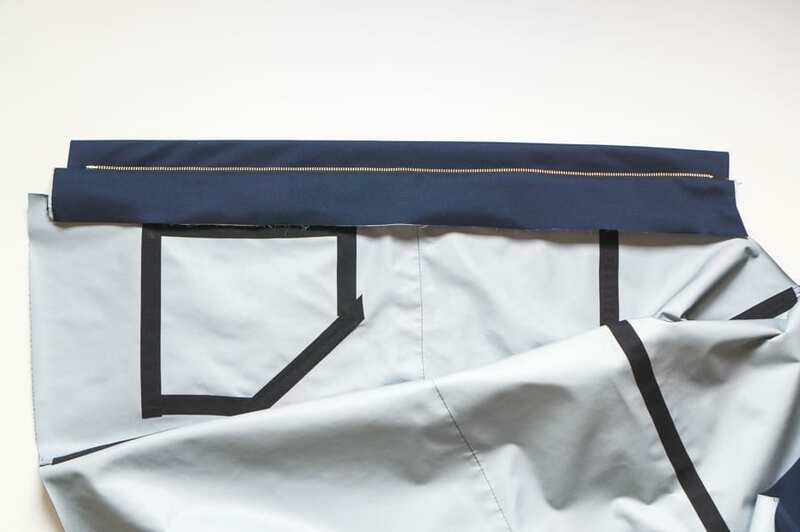 Since the jacket was originally designed to be unlined, the placket offers an attractive way to conceal the zipper and create a professional, neat finish on the inside. 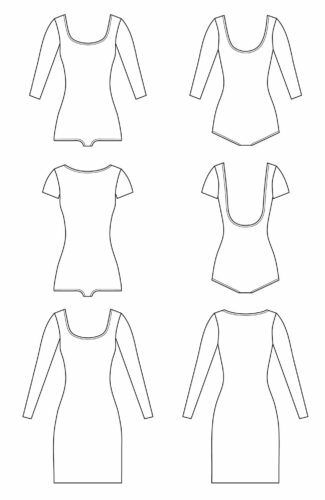 The method differs a little for the lined version, but we’ll be covering both in this post. 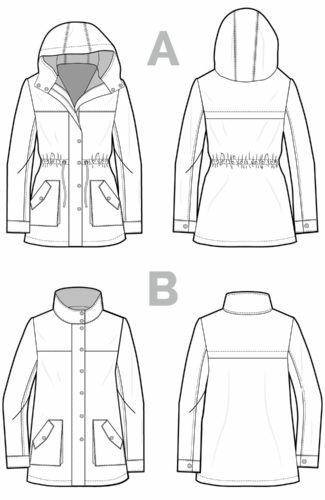 Before you get started, the body of your jacket should be fully assembled. 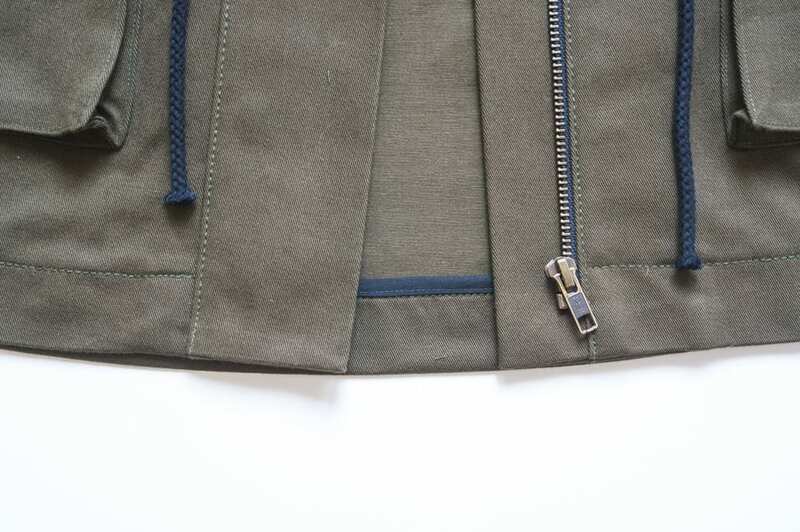 You will need to attach the drawstring casing (if you’re installing one) to your jacket before sewing on the zipper, since the ends of the casing will be secured into the seam allowance of your right zipper placket and left zipper facing (see our earlier post). 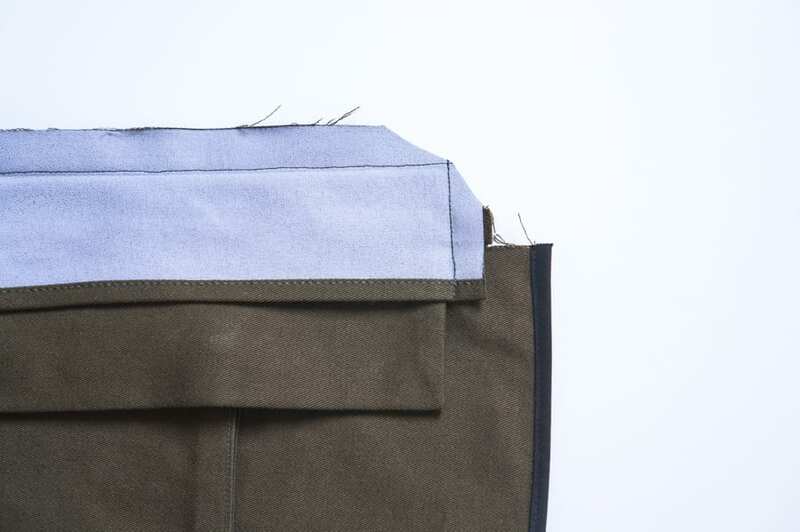 If you are not lining your jacket, finish the hem of the jacket now. 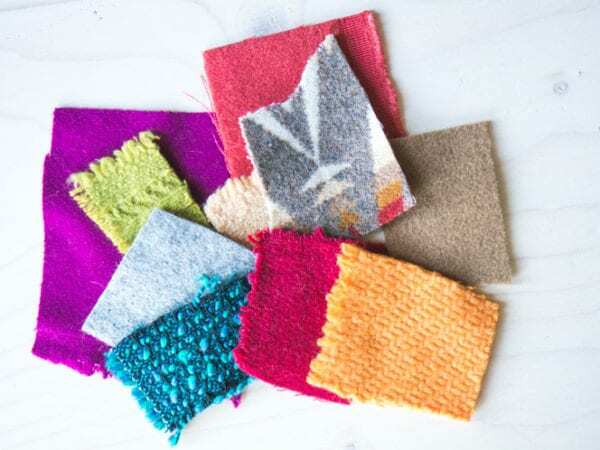 Use a serged stitch or bias bound finish (I did a Hong Kong finish for this sample – see this post on how to sew these seams). 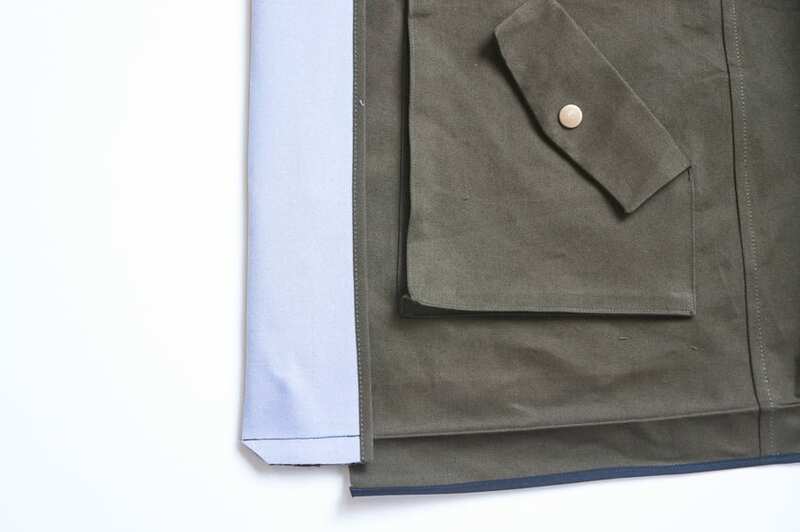 To get started, let’s assemble the placket itself. 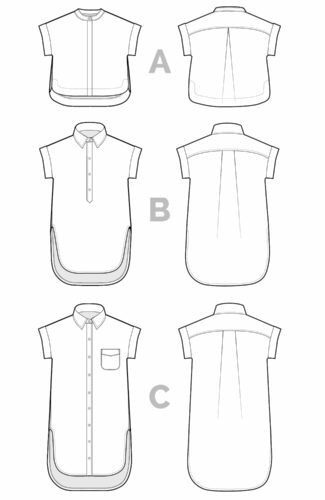 Ensure the exterior side of the right placket (pattern piece J) is interfaced. With right sides together, stitch along the bottom edge only. 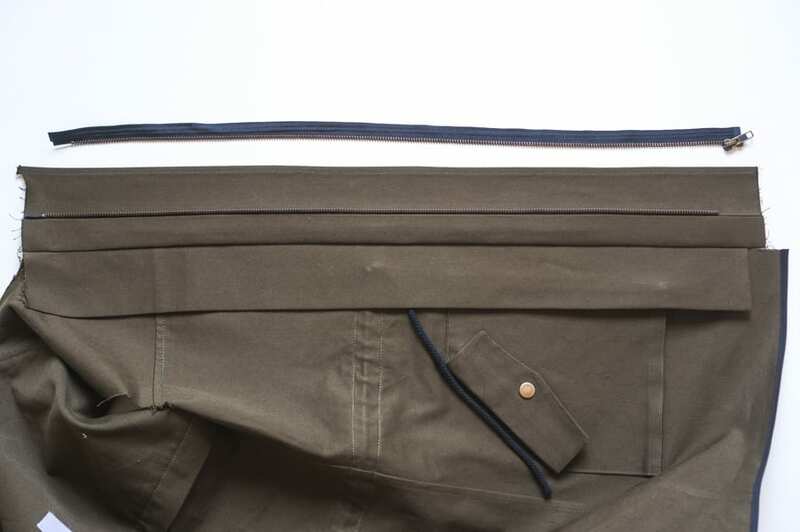 Trim the seam and clip the corner so when you turn it inside out it creates a nice sharp 90 degree corner. Press. 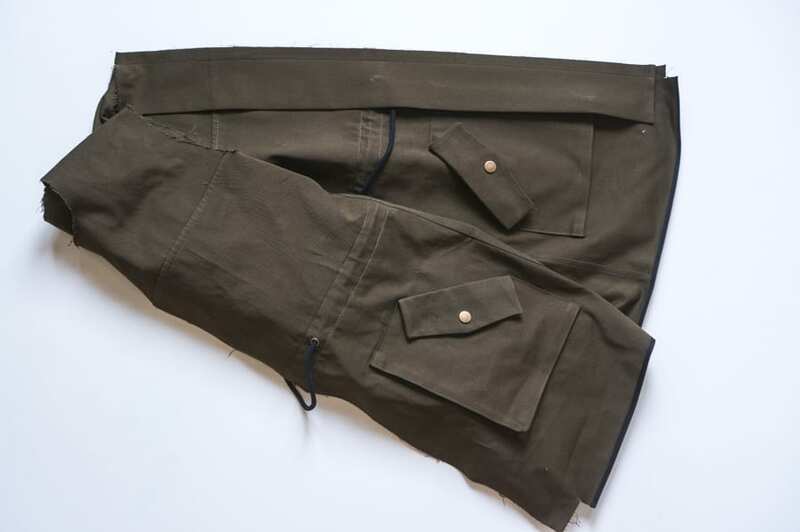 In the image below you can see how it will be attached to the jacket. Notice the the raw edge is on the top along the neckline. 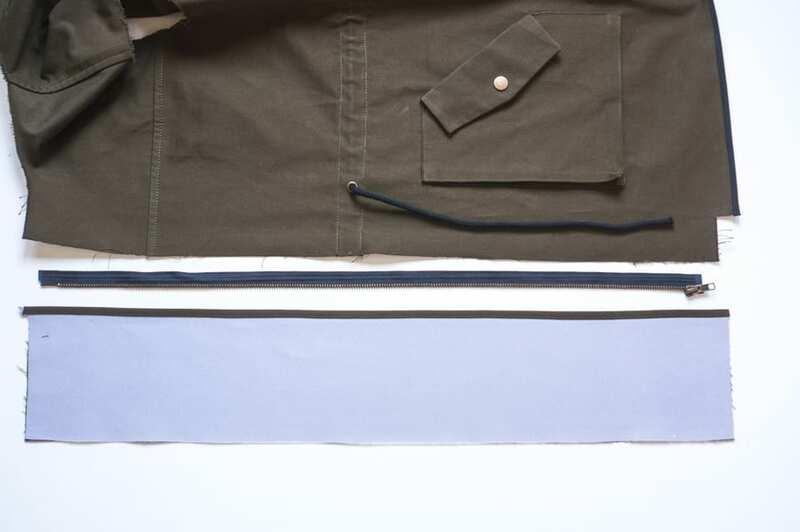 Line up the placket (J) with the right side of the jacket, raw edges together. 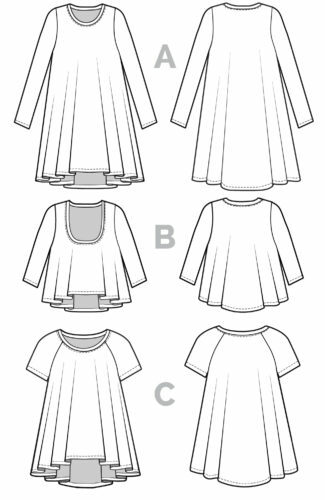 The top should align with the neckline, the finished bottom edge of the placket should align with the bottom notch along center front. 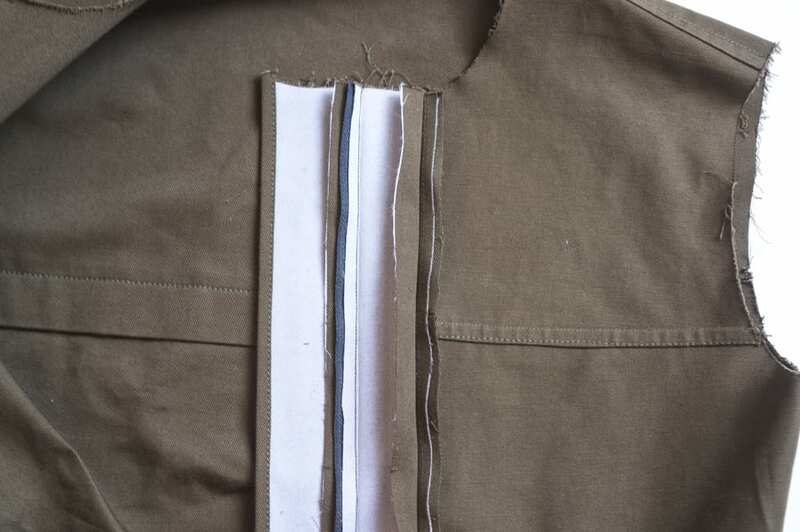 Sew the placket (J) to the jacket along the seam allowance. Now open your zipper. 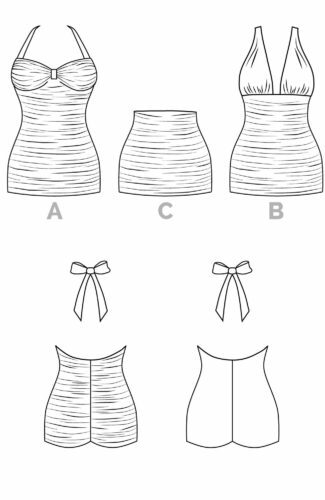 Pin the left side of the zipper to the side of the top right facing (pattern piece K) as shown below (when I say the left side of the zipper I mean as you are looking at it; technically it is the right side of the zipper since it’s being sewn to the right side of the jacket if that makes any sense). 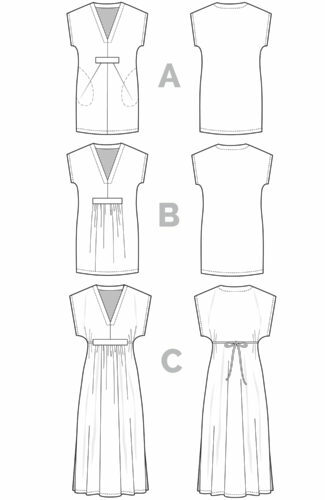 The zipper teeth should start 1/8″ below the 5/8″ seam allowance so they are not caught in the stitching when you finish the neckline. 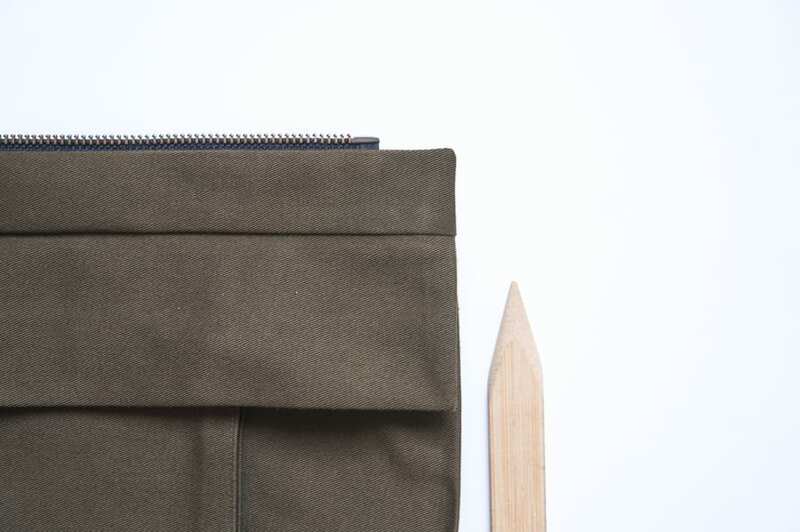 It’s okay if the zipper doesn’t span the entire length of the facing – just ensure the zipper stops at least 5/8″ from the bottom, again so it’s not caught in a seam line. 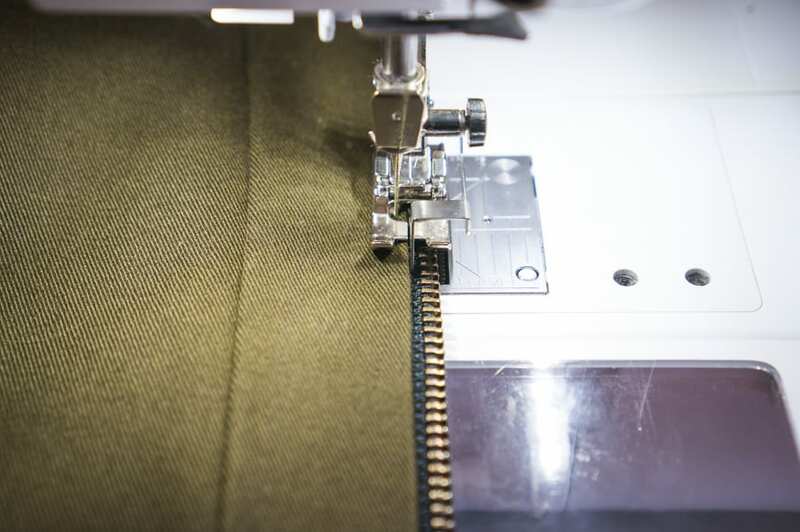 To ensure proper snap placement later, it is important to sew the right and left sides of the zipper to their facings at the correct 5/8″ seam allowance. 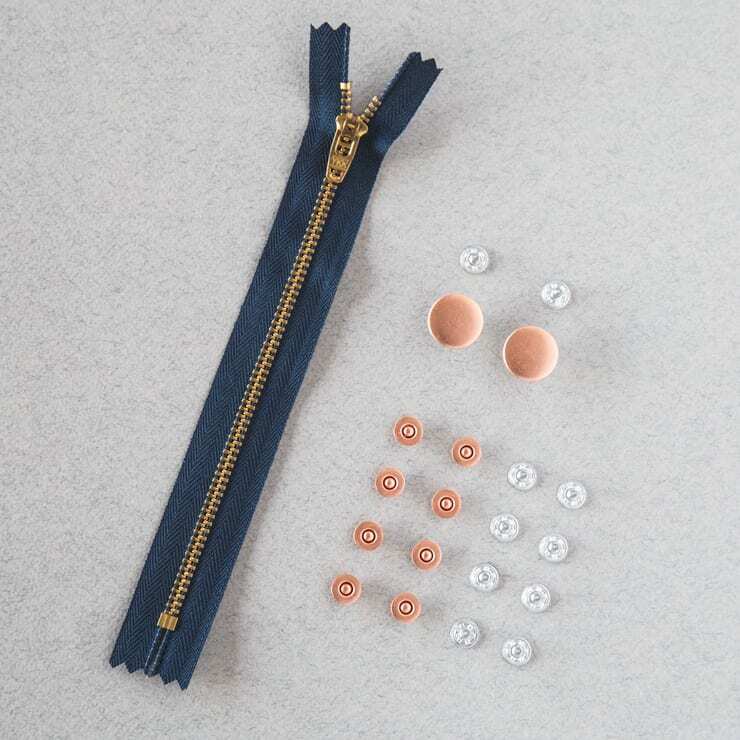 You will also want to make sure the zipper teeth are at least 1/8″ away from your stitch line so you can move the zipper pull freely. 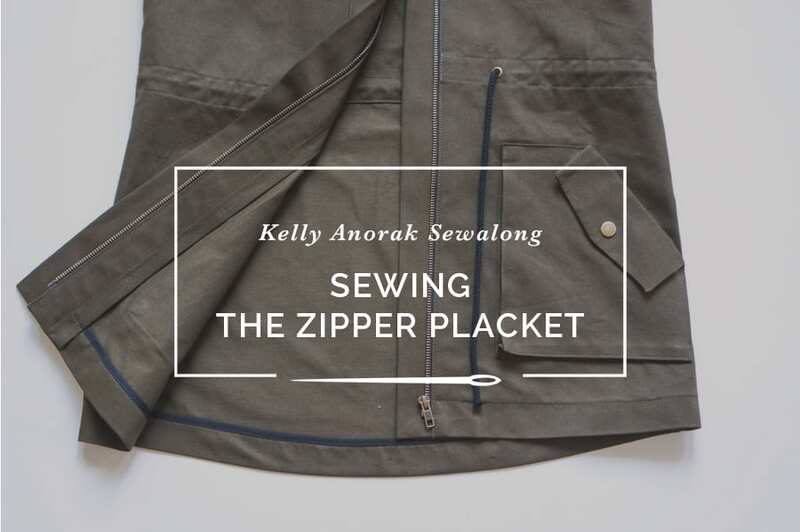 (If you are using the first edition of the Kelly Anorak instruction booklet, it may indicate a 1/2″ seam allowance at this step. This has since been corrected, and you can download an updated version of these instructions here). 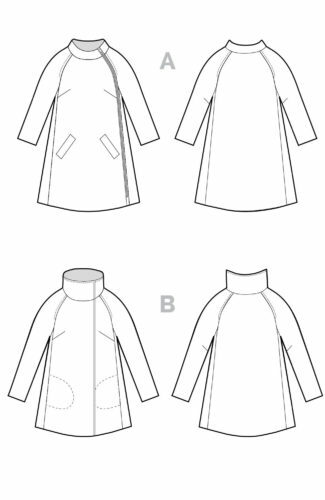 If you are sewing the unlined jacket, the bottom right facing (pattern piece L) should be folded in 1/4″ twice along the side with the higher corner and stitched into place. Leave as is for lined version since this seam will be finished later when it’s attached to the lining. 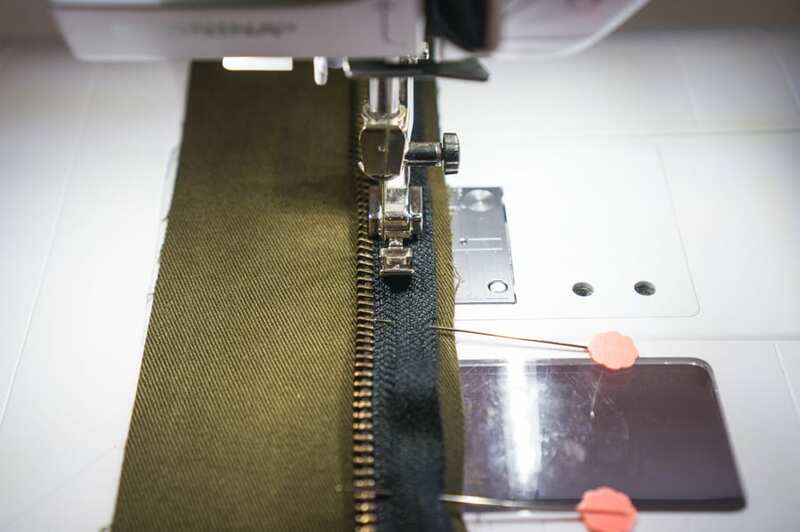 Stitch the zipper to the top right facing (K) using a zipper foot. 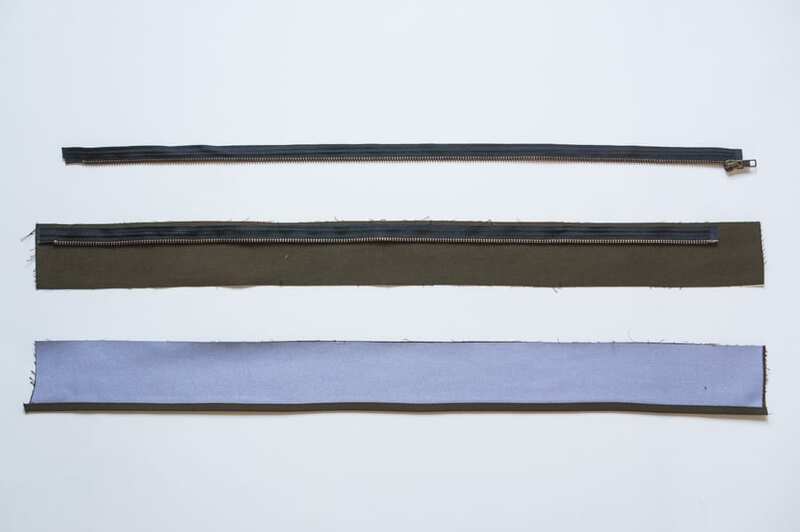 I set the zipper tape in 1/8″ from the raw edge and sewed 1/8″ from the teeth to get the correct seam width of 5/8″. 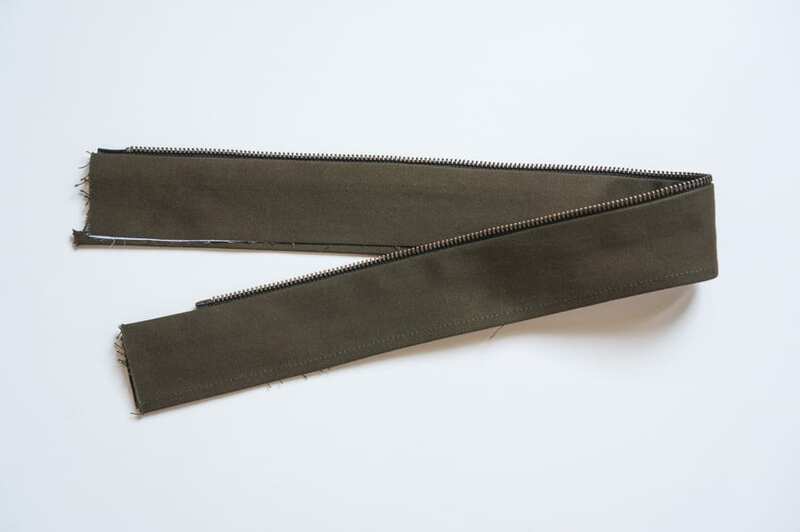 Here’s what your zipper will look like when sewn the the top facing. 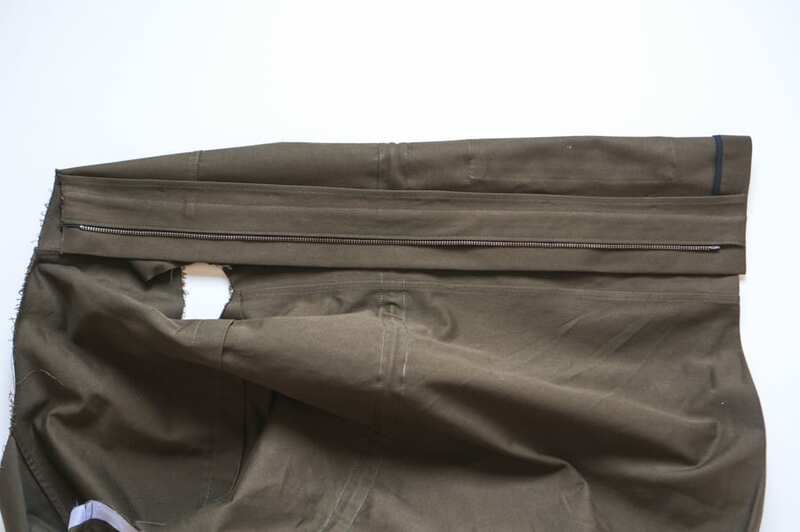 Right sides together, align top (K) and bottom facing (L) along the zipper seam; note that the taller side of the bottom facing (or the side you folded and stitched if you’re not lining it) is on the opposite side. Pin into place. 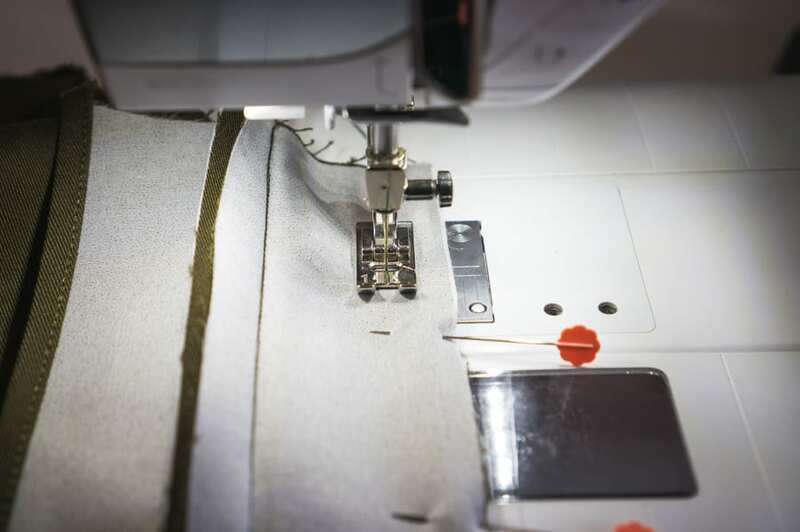 Stitch together using a zipper foot; try to stitch as closely as possible to the original stitch line attaching zipper to top facing. 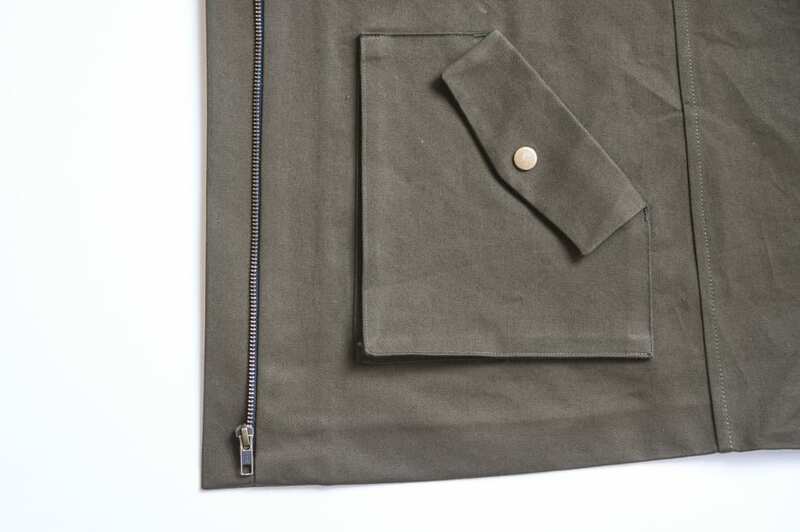 Fold wrong sides together and press flat, so the zipper is sandwiched in between. Now to stitch the facing to the jacket… open the facing and pin the top facing (K) to the right jacket front. It will now look like this when unfolded. 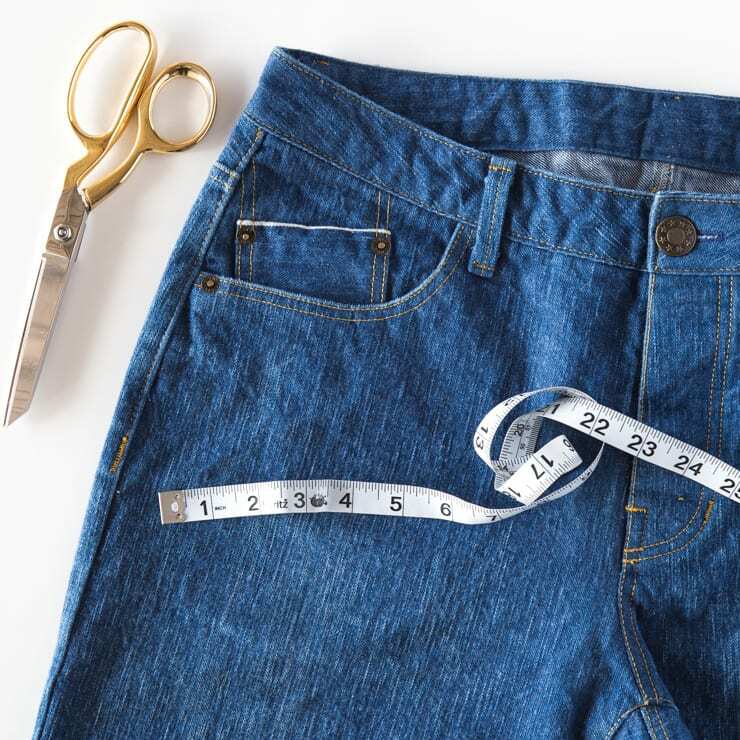 Now grade the seams to reduce bulk – this means trimming them so they step gradually down and you don’t have one big bulky seam. 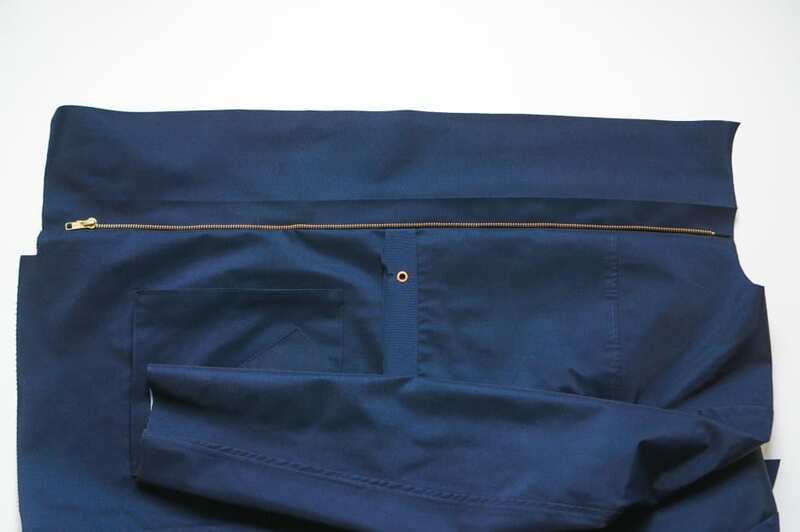 The widest seam should be touching the main body fabric, or the side you’ll see from the right side of the jacket. 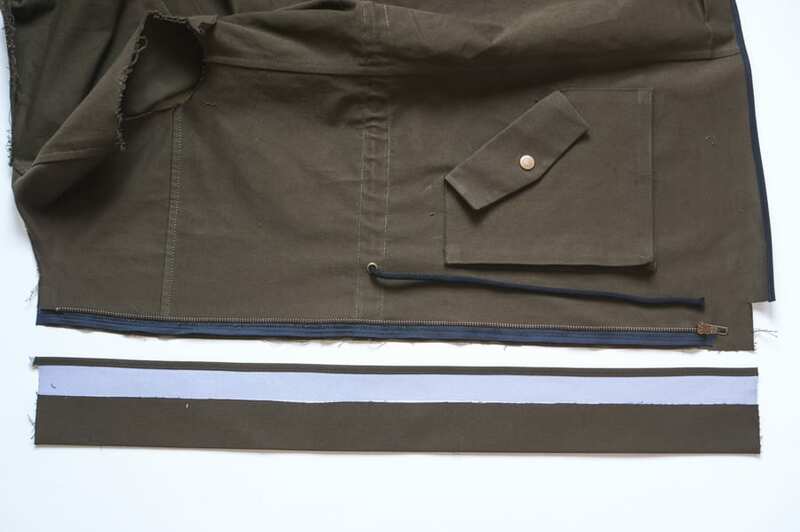 If you are sewing a lined Kelly Anorak, you are now finished with the right side of the jacket and can move on to the left side. 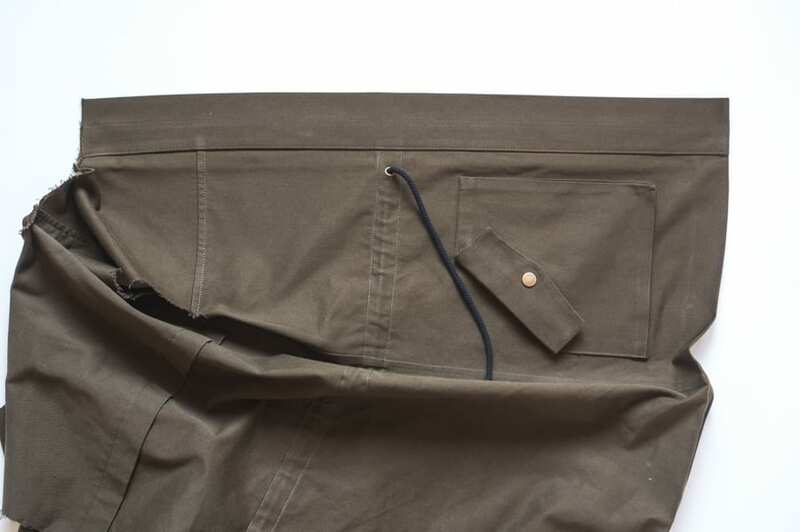 The raw edge of the bottom right zipper facing will be finished when we sew it to the lining. 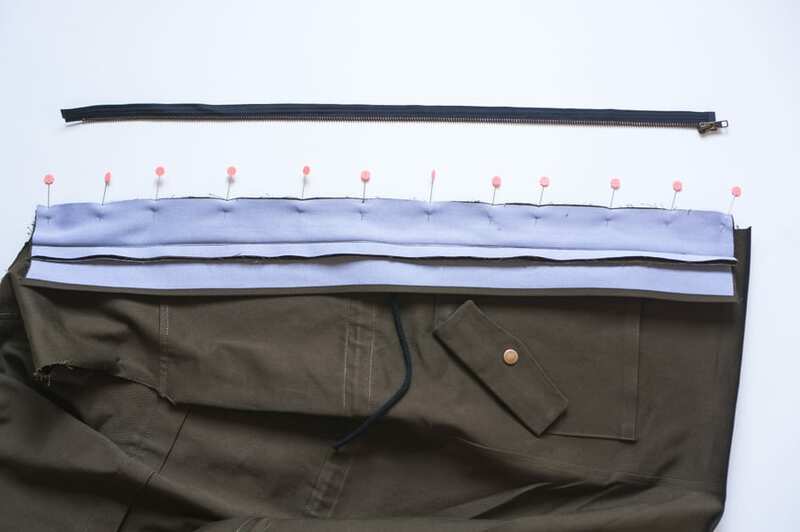 Skip down below to where we install the left zipper placket. 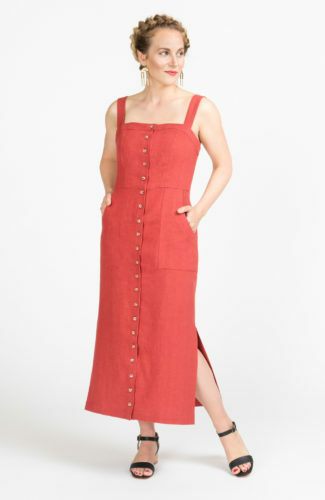 Unlined version only: fold the facing right sides together along the zipper seam. 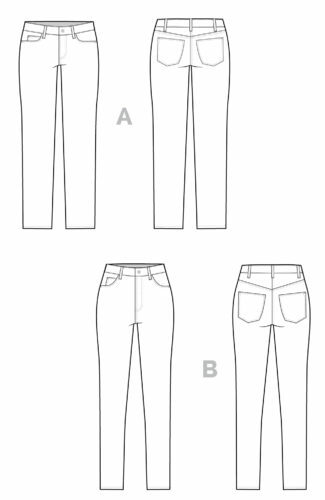 Starting at the notch 5/8″ from the edge of the jacket hem, sew a straight line across the length of zipper facing, at a ninety degree angle from the center front seam. 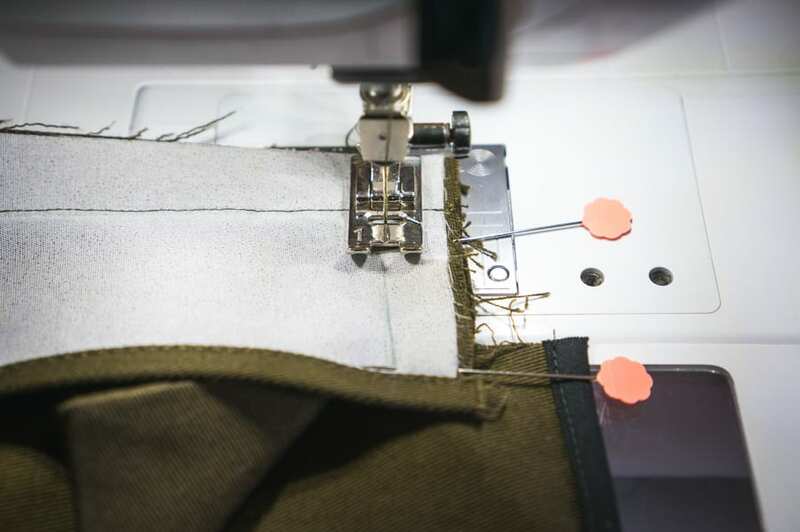 Make sure you are not catching the zipper placket in your stitching; you can see below I’ve drawn in my stitch line and folded the placket out of the way. Stitch the bottom edge of the facing all the way to the end. Trim the corner so when you flip it right side out it creates a nice crisp corner. Turn everything right side out. The facing edge is now finished and in line with the finished edge of the placket. 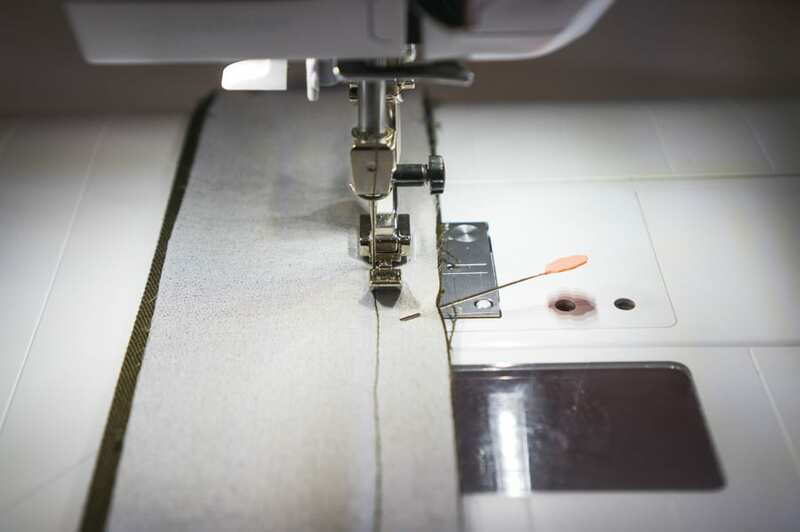 Before we stitch the facing and placket down, ensure the hem seam is finished. 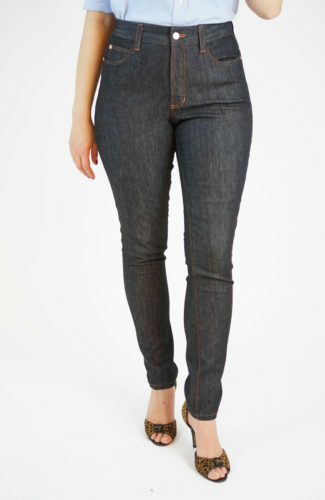 Press the hem up 1.5″ all the way around. 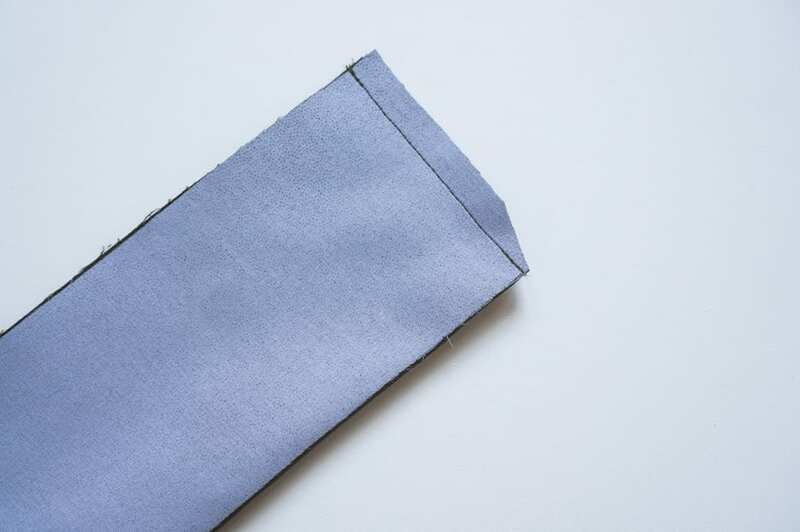 The folded hem should align with the finished placket edge. 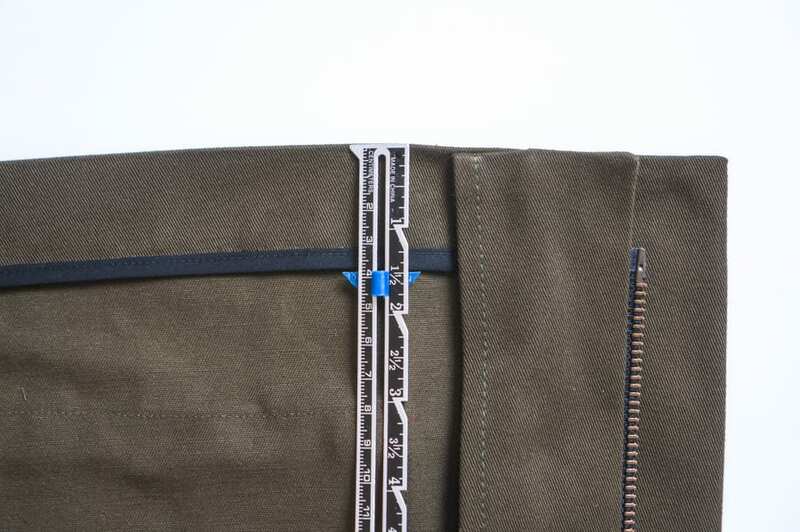 To lock everything down securely, topstitch along the length of the zipper facing, 1/8″ away from the zipper teeth. 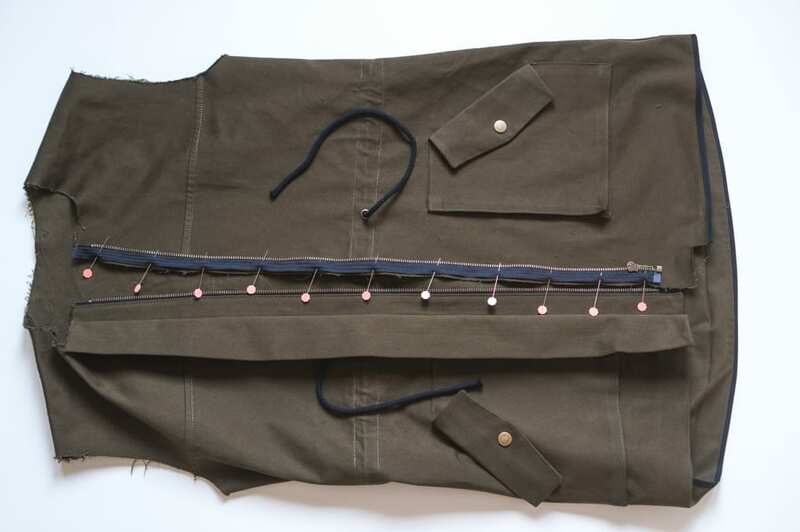 Then press the placket flat and topstitch along the length of the placket, anchoring it through all the layers below. 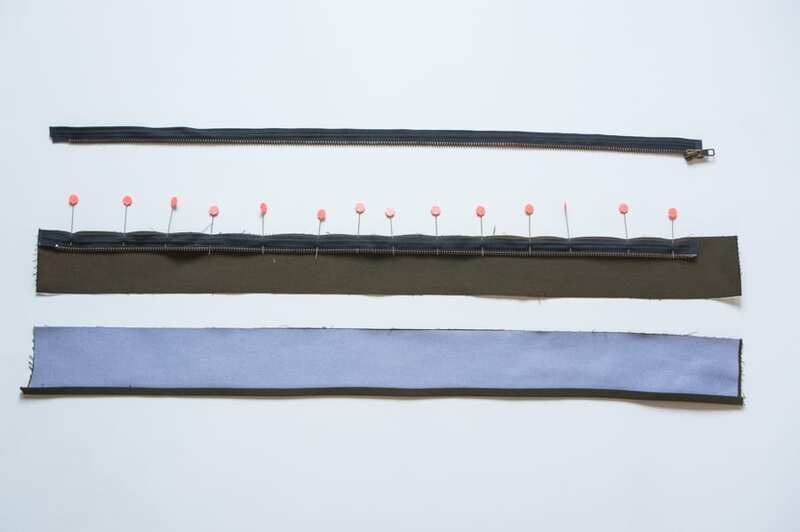 You can topstitch along the placket itself or just next to it; depends on what you prefer. Here is what it looks like from the wrong side once it’s fully topstitched. Now to the left side! 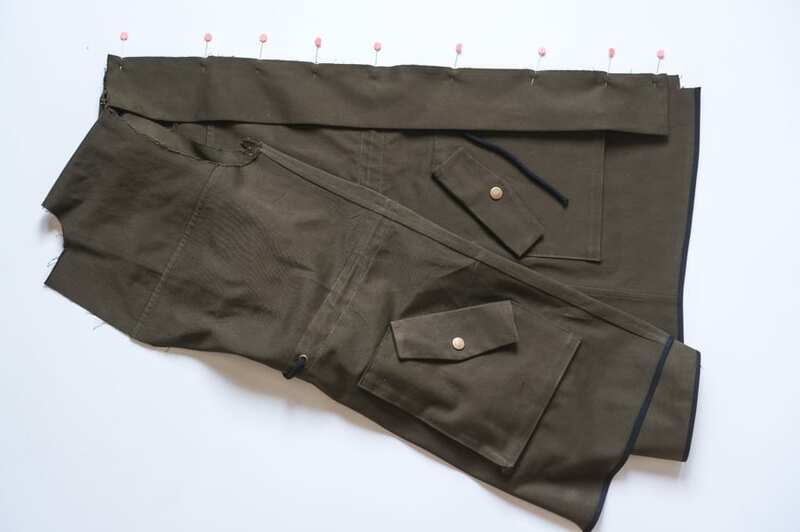 This facing is a little different – since we’re sewing the zipper straight to the center front seam, the facing is in one piece instead of two. 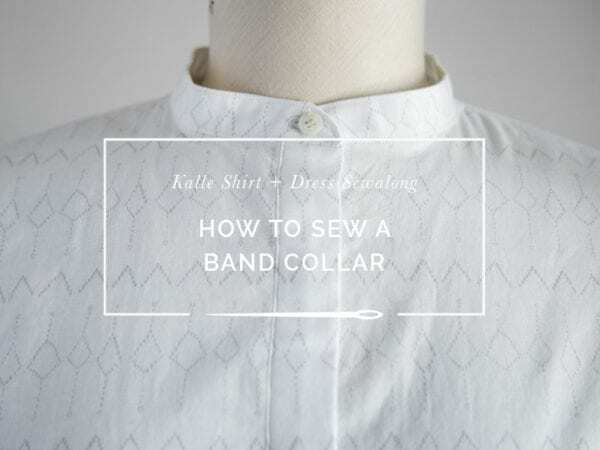 Unlined version: finish the slightly higher side by folding in 1/4″ two times and topstitching. Leave as is for unlined version. 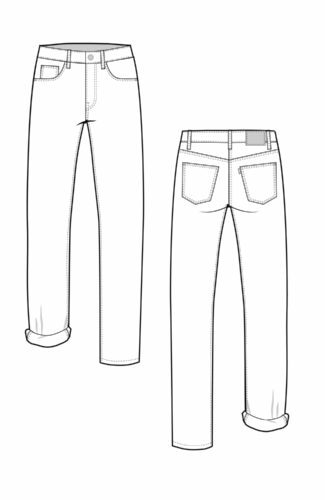 Make sure the center front jacket seam is interfaced – the zipper will be applied here and if it’s not interfaced you’ll get a wavy seam. 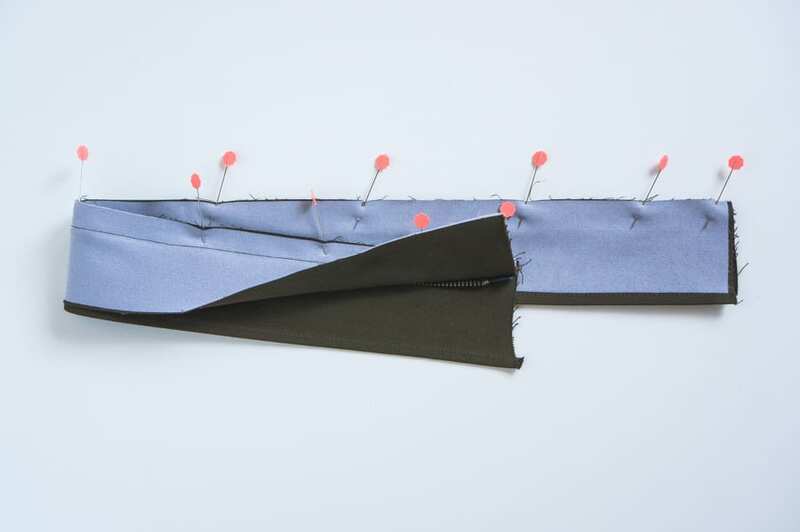 Pin the other half of the zipper into place along the left jacket seam, ensuring it will be sewn at the correct 5/8″ seam allowance, and that the zipper teeth are 1/8″ away from the stitch line. 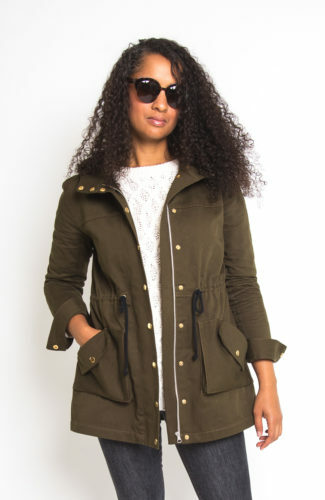 Make sure it matches up with the zipper half on the right side of the jacket. 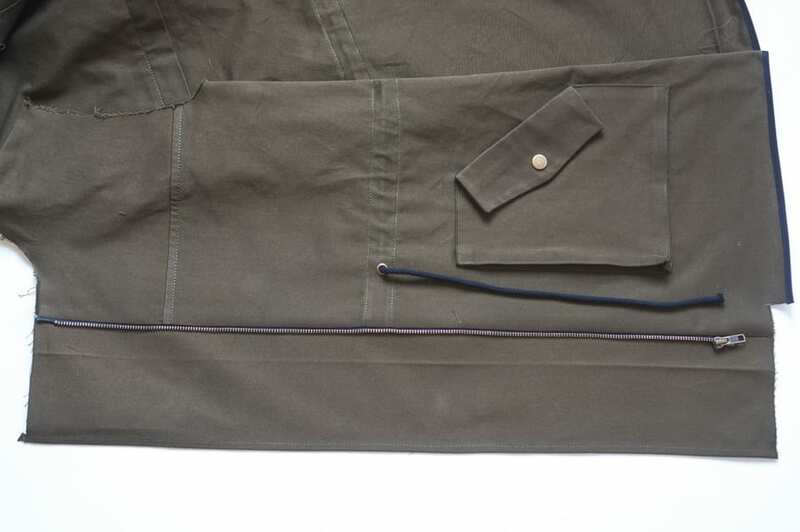 Stitch to the jacket using a zipper foot. Next, fold the left facing in half, wrong sides together along the first set of notches. Press. 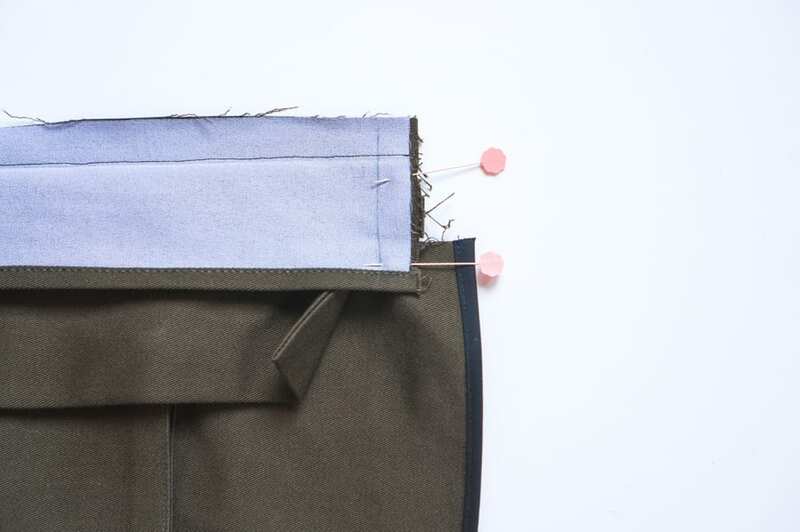 With right sides together, unfold the facing and line up the raw edge with the center front jacket seam. 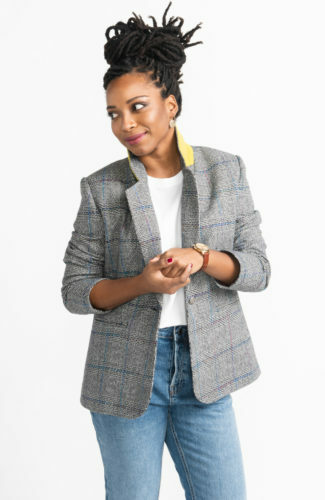 Fold the facing right sides together along the pressed edge and sew across, 5/8″ from the bottom edge of the facing, just like you did on the right side of the jacket. 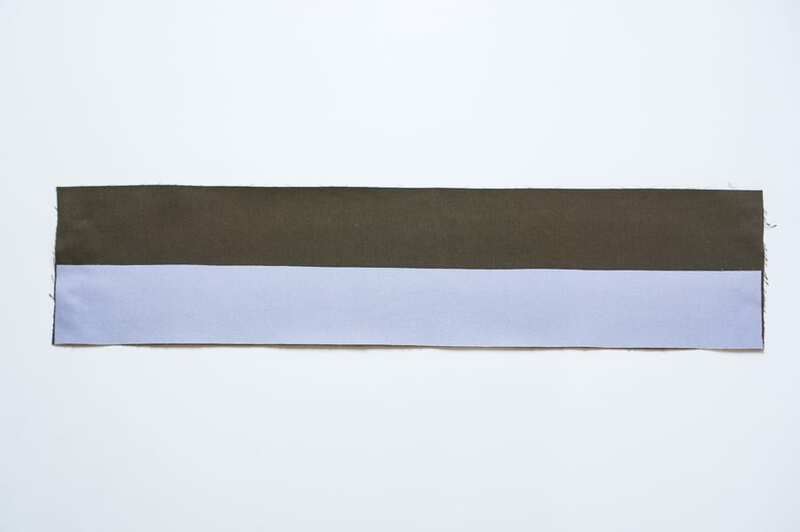 The stitch line should line up with the folded edge of the hem. Trim the corner down so it can be crisply turned right side out. 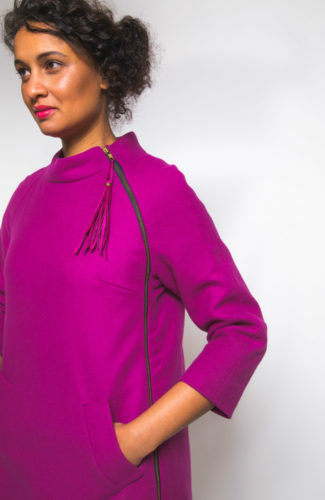 Grade the seam, press everything flat again and topstitch thezipper to the facing along its entire length, anchoring it through all the layers. 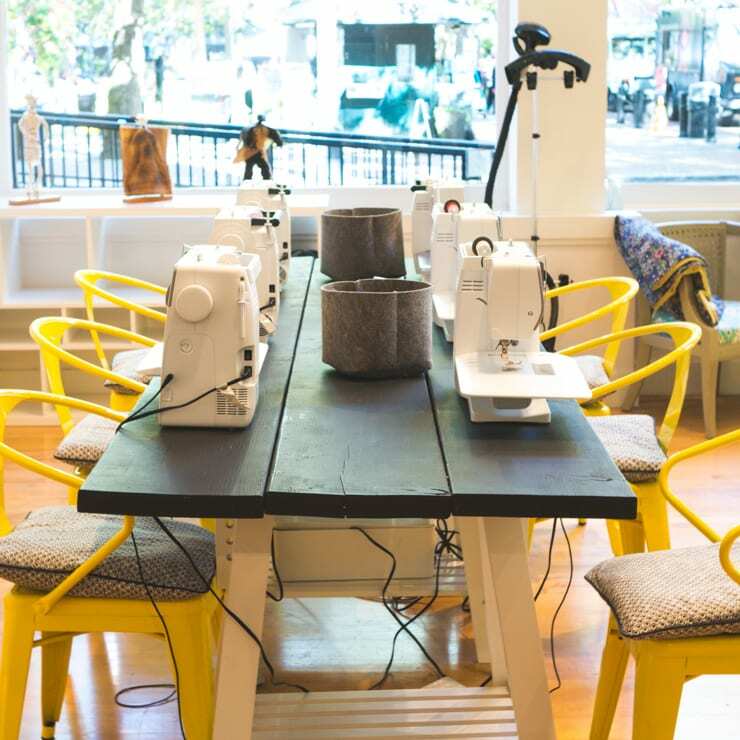 Now topstitch your hem down. 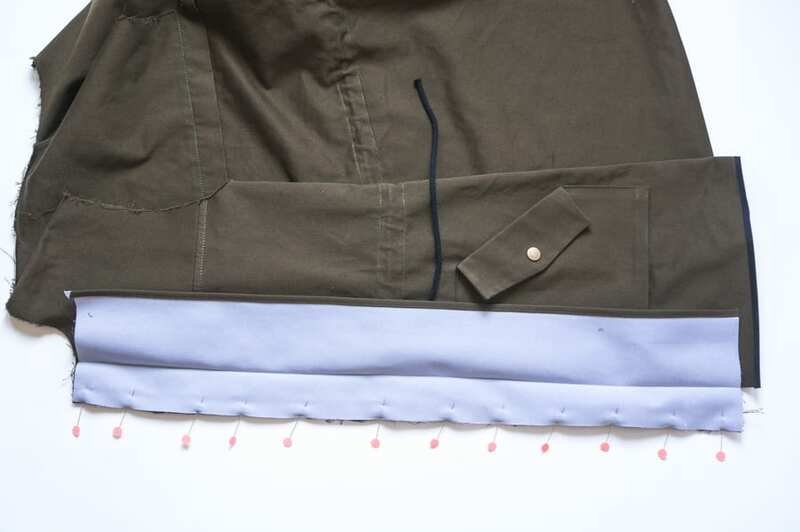 I stop the hem topstitching where it meets the placket on the right side, and the zipper on the left side. Whew! Hopefully this walks you through this stage! It’s quite a few steps (especially when I break it down this much!) but I think it’s so worth it. The inside ends up looking as pretty and polished as the outside, doesn’t it? 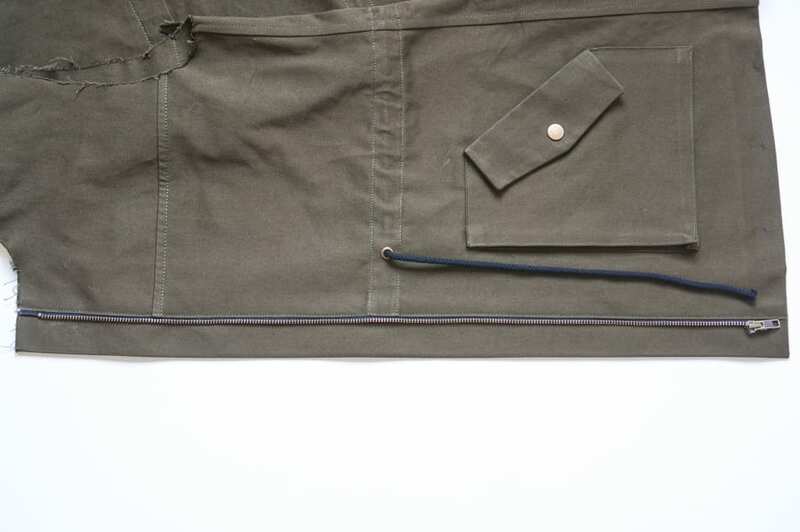 Sewing a lined Kelly Anorak? 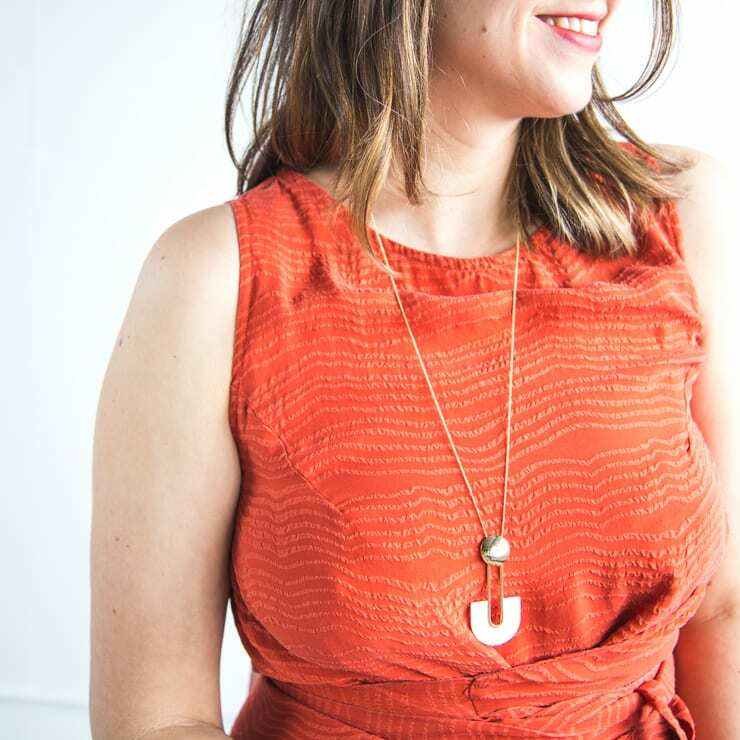 Read the next post in our Kelly Sewalong series. 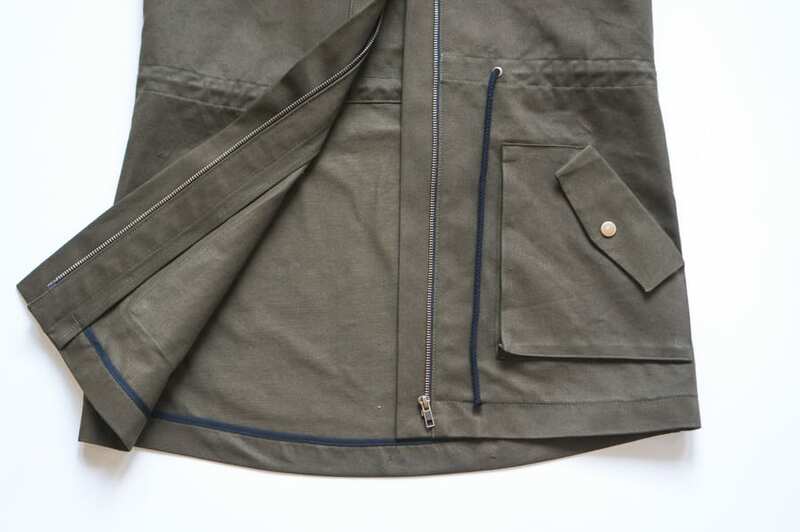 Sewing an unlined Kelly Anorak? 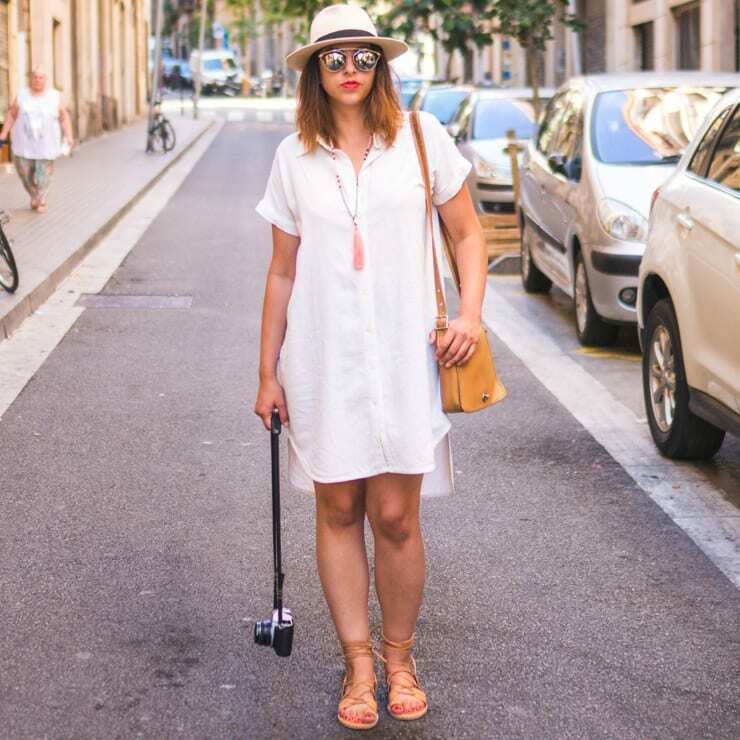 Read your next post here!